Earth Matters - Why So Many Global Temperature Records? See the chart below to get a sense of where the gaps are in the various records. Areas not included in the analysis are shown in gray. JMA is Japan Meteorological Agency data, GISTEMP is the NASA Goddard Institute for Space Studies data, HadCrut4 is the Met Office data, UAH is a satellite-based record maintained by the University of Alabama Huntsville (more on that below), NCDC is the NOAA data, and NCEP/NCAR is a reanalysis of weather model data from the National Center for Atmospheric Research. If you’re a real data hound, you may have heard about other institutions that maintain global temperature records. In the last few years, a group at UC Berkeley — a group that was initially skeptical of the findings of the other groups — developed yet another approach that involved using data from even more temperature stations (37,000 stations as opposed to the 5,000-7,000 used by the other groups). For 2014, the Berkeley group came to the same conclusion: the past year was the warmest year on record, though their analysis has 2014 in a virtual tie with 2005 and 2010. + UCAR’s Global Temperature Data Sets Overview and Comparison page. + NASA GISS’s GISTEMP and FAQ page. + NOAA’s Global Temperature Analysis page. + Met Office’s Hadley Center Temperature page. + Japan Meteorological Agency’s Global Average Surface Temperature Anomalies page. + University of Alabama Huntsville Temperature page. +Remote Sensing Systems Climate Analysis, Upper Air Temperature, and The Recent Slowing in the Rise of Global Temperatures pages. + Berkley Earth’s Data Overview page. + Moyhu’s list of climate data portals. + Skeptical Science’s Comparing All the Temperature Records, The Japan Meteorological Agency Temperature Records, Satellite Measurements of the Warming in the Troposphere, GISTEMP: Cool or Uncool, and Temperature Trend Calculator posts. + Tamino’s comparing Temperature Data Sets post. +NOAA/NASA 2014 Warmest Year on Record powerpoint. +James Hansen’s Global Temperature in 2014 and 2015 update posted on his Columbia University page. 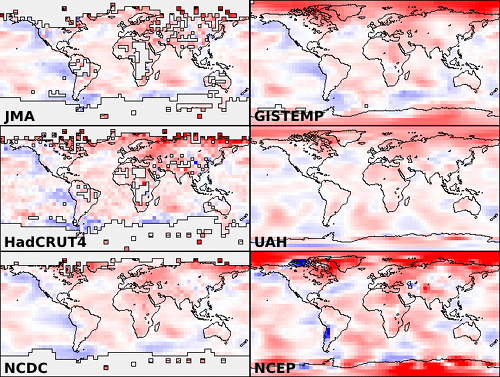 +The Carbon Brief’s How Do Scientists Measure Global Temperature? +Yale’s A Deeper Look: 2014’s Warming Record and the Continued Trend Upwards post. This entry was posted on Wednesday, January 21st, 2015 at 10:50 am and is filed under Earth Indicator, NASA News, Uncategorized. You can follow any responses to this entry through the RSS 2.0 feed. Both comments and pings are currently closed. Oh boy! 99 percent coverage, much of which is “estimated” (interpolated) by believers and thus unrepresentative. Glad you had the courage to note the miniscule temperature differences. The amount of the temperature claimed to make last year the warmest ever experienced by mammals is way, way, way, smaller than the margin of error of the ability to measure temperature. Hello!?! So, stop the nonsense that man-made global warming is “the” reason for any (wishful) measured warming. I recommend actually reading the article instead of looking for bits to support your biases. r medred, I disagree with what you wrote “99 percent coverage, much of which is “estimated” (Interpolated)”. If the data set with no interpolation, JMA, has 85% covered, then the NASA data is only 14% interpolated. Interpolation uses the neighboring measurements and applies the weather trends to estimate the temperature in uncovered areas. Did you look at the graph? Sometimes the JMA data is the highest and sometimes it is the lowest. Hello? did you look at the graph, note that all the organization’s data shows the same OVERALL TREND. Compare 2014 to 2000 to 1990 to 1970… All the data shows a SIGNIFICANT increase! How a land and sea surface temperatures are measured by satellites? While today’s temperature measurement are becoming more and more accurate, I always wonder how accurate temperature measurements were 50 to 100 years ago. My question is “How reliable, accurate were these global measurements”? There were many more measurement “gaps” back then back hence plenty of room for error yet these data are treated as scientifically accurate as today’s data. How can climatologists use these data for comparison when they may be inaccurate? Let’s say in one century the average temperature of the earth has increased 1 degree. How much energy does it correspond? Compare this value to the energy needed to support the ice loss on the pols and in the permafrost during the same period. I guess the second value is way bigger than the first. The trend of this temperature increase show much less than the real global warming is. I wouldn’t even call our age as “global warming” rather “global melting”. The drastic increase in global temperature starts in centuries when there would be no ice to be melt any more to counteract energy inbalance of 0.5 W/m2 of the Earth. Thanks for the piece but it does show the entire global temp picture is built on sand. At circa 150 million sq kms the surface of the earth is non homogenous and temp trends produced from about 20k points to accuracies of tenths and hundredths of a degree borders on ludicrous. These points lie in predominantly urban areas and deriving global policy on such poor data is like deciding to switch the heating on or off in an old persons residential home based on temp records from just the kitchen during cooking. Root and branch methodolgy review required in matters climate. Love to know just how accurate the ability to take global temp was 100 years ago. Not at all I guess. People didnt worry about such things No one travelled and if they did it was on a ship etc. They were not worried about accurate temp taking at all 100 years ago even if the machines to take it were accurate and I doubt that. i think this global warming is a lot of hype made by scientists keeping themselves in a good job. The real problem is the fact oil will run out and there is no alternative So what does the human race do then as we depend on it for everything.